Aloha and bonjour, my friends! It is my eleventh week and though I have no clock, I can hear the countdown for my return to North America. Like previous returns, I think the first thing I’ll notice is how I don’t have to think about what people are saying as much. The simplicity of my native language will return to the background of everything and all the noises near and far will tell me something… whether I wanted to know those things or not. 1. I love champagne, but even successful rap stars go broke drinking Crystal and Dom Perignon all the time. I make my champagne fetish more budget conscious by indulging in the occasional Italian prosecco or Spanish cava sparkling wines. When I’m very brave, I’ll even try an American sparkling, but I’m trying to stop this kind of self abuse. Recently, I found a budget champagne, Charles de Cazanove Rose Brut. Holy nom! It was on sale for 14 Euros at the G20 Supermarche. Listen up rap stars, if you want to get your entourage drunk and happy and still keep your money for custom-made Escalade accessories… the price to numminess ratio of this stuff is the best I’ve seen in the alcohol world. 2. I’ve been to the Louvre seven times. I have not seen it all. Most of the time I have gone with a friend, but I have stopped going from artwork to artwork with a friend. Observing art is an individual thing that I really don’t think can be shared with anyone unless they are on some weirdly mutual psychic wavelength. On my seventh trip I discovered where they had hidden all of their Rembrandts. I wasn’t ready for them. Tears followed. I hope I can manage one or two more trips to see them again before my time is up. 3. My impending departure from Paris is starting to feel like a combination of exile, for unspeakable crimes and a ‘timeout’ in a relationship with a long-term girlfriend. I don’t want a time out. I don’t want to leave, but I must. It won’t be pleasurable booking my flights to leave. 4. 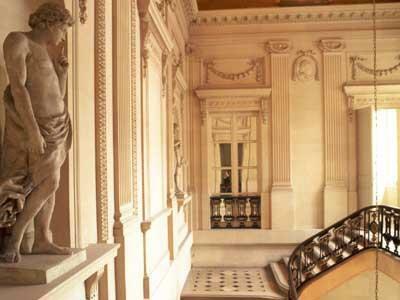 The US State Department owns 3 buildings in Paris, the most beautiful of which is the Hôtel de Talleyrand. Through a friend of a friend, I ended up at a party there, a tribute to an American painter named Beauford Delainy. The tribute was very apropos, the champagne was delicious, and the company could be described as the best sorts of people you will find anywhere in the world. 5. I still consider it to be one of life’s little victories when I can get into a Parisian restaurant or café, order my meal and pay for it without a word of English being spoken. Ex-pats that I’ve met tell me that after years in Paris, they continue to be in danger of being addressed by the wait-staff in English. Some feel a little indignant about it, of course. It is not easy to learn a new language and near mastery with an accent should be good enough to continue in French. A clever friend of mine suggested that when this happens, to compliment the waiter/waitress’ English… and you will get very good service from there on. 6. Halloween is fast approaching and though it is not widely celebrated in Paris it is one of those times where Americans (or possibly Canadians) and their friends can be spotted in full costume in pubs, nightclubs or the local McDonalds’, depending upon their age. Vampires, of course, take advantage of this time to feed in the open and vampire hunters, in turn, can walk the streets in full vampire hunting gear bringing a final death to as many of these soulless bloodsuckers as they can fix their crossbow sights upon. 7. The Paris Auto show went on this week and it was probably the most super-awesome vehicle related spectacle I’ve ever seen. When I say awesome, I mean that I was filled with awe. Electricity was the central theme of this year’s show with just about everyone presenting either an electric or hybrid car. Listen up you crazy American automakers; in the new, new, new economy, green begets green. and agents were standing by to sell you one. 8. When I first thought about coming to Paris, of course the imagery of a bohemian lifestyle surrounded by writers, artists, and sundry turn of the century hipsters all flashed through my head. Though it is the turn of a new century and “bohemian” apartments now run at about 2,000 Euros a month, I’ve been surprised not only to find, but befriend some writers and artists. One of my new friends is published and in the process of writing a sequel. Naturally I’m seething with envy, but so very glad to have made her acquaintance. I’ve posted her book to the right. 9. Well October is well upon is and the weather has understandably cooled. Now the fall fashions that magically appeared in September are starting to look more practical. Some of my new friends in Paris have taken the time to warn me of the brutality of a Parisian winter. I can only laugh and say, “I’m Canadian!” Need I say more? 10. In addition to a notable writer, I’ve made about a dozen friends in Paris in my short time here. Some are expats, some are French and some were born and raised in Paris. In their own way, they are all Parisian and I have started to feel that I am becoming one myself. So far, the locals have seemed quite welcoming. I have to say that I did not necessarily expect their welcome. I hope the government will welcome me in the form of a visa; time will tell. That is all for this week! Though I’ll be sad to leave Paris; happily, I’ll be seeing many of you again in the weeks to come as my travels take me around the globe.